As we wait patiently for the Cyber Monday camera deals to start appearing, we have spotted this little bargain lurking in Amazon UK's online store. This unassuming Panasonic compact camera is not the sort of thing for the serious photographer, perhaps, but it is a perfect Christmas gift for someone who wants a camera that gives more zoom power than their mobile phone. 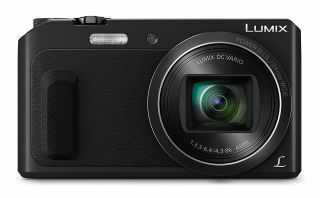 The Panasonic Lumix TZ57's key attraction is that it has a 20x zoom lens built in - covering everything from a 24mm wide-angle to a 480mm supertelephoto, so can shoot architecture and landscapes, or get in close for shooting wildlife. It is rather easier to use for selfies than your mobile phone too - as it has a flip up LCD screen that can face forwards to enable you to frame the perfect shot on its 16 megapixel camera, or to record a vlog using its Full HD video recording capability. Your pictures can then be beamed to your phone using the WiFi facility. The Panasonic camera weighs just 249g with rechargeable battery and SD memory card, and measures 108x60x32mm... so is small enough to fit easily in your coat pocket or handbag. The compact is currently one of Amazon UK's highlighted deal, and at £119 is the cheapest we have ever seen this camera in the UK. Argos are still listing this at £199, so this is definitely a bit of a bargain. Save £80 This pocket camera may help you with your Christmas shopping at this price. The 16 megapixel compact has a 20x zoom lens, and has a three-inch tilting LCD that flips up to make a cinch of selfies. Full HD video recording and WiFi connectivity complete the specification for a camera you can carry wherever you go.